As a guitarist he is mainly concerned about the search for new sounds on his instrument. He plays electric and acoustic guitar with or without preperations and tries to find new ways of playing the guitar within the context of free improvised music and Jazz. As a composer he tries to use different techniques of writing music and therefore musical thoughts (standard notation, graphic notation, verbal instructions etc.) to ultimately inspire improvisation to happen in another way than it would without a composition. As soundartist he is mainly involved with sound installations which involve the recipient as a part of the actual work, because the work has to be played by the recipient. The works encourage the recipient to make a special aesthetic experience with different sounds. The aesthetic of these sounds is inspired by the aesthetics of free improvised music. 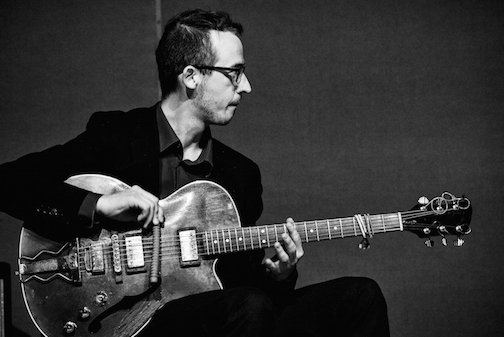 Studied Jazzguitar, Philosophy and German philology at Friedrich-Wilhelms Universität Bonn and Gutenberguniversität Mainz. He has worked with: Paul Lytton, Frank Gratkwoski, Phil Minton, John Russell, Michael Vorfeld, Rudi Mahall, Christian Lillinger, Axel Dörner, Thomas Lehn, Etienne Nillesen, Robert Landfermann, Carl Ludwig Hübsch, Paul Hubweber Philip Zoubek, Matthias Muche, Matthias Müller, Christian Marien, Ignaz Schick, Emilio Gordoa, Korhan Erel, Alfred Zimmerlin, Harald Kimmig, Udo Moll, Ryan Carniux, Joker Nies, Georg Wissel, Uli Böttcher, Jörg Fischer, Dirk Marwedel, Ulrich Phillipp etc. Concerts led him through all parts of Europe.